Brigitte Chamak and Baptiste Moutaud, eds. 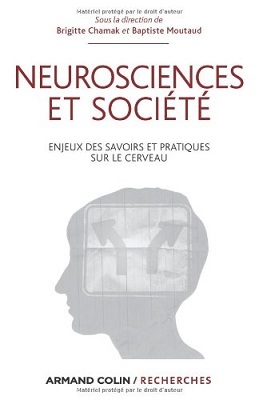 Neurosciences et société is a valuable addition to the diversified universe of studies concerning neurosciences in society. Indeed, the last few years have seen the publication of a number of important articles, single-authored books, and edited volumes on different dimensions of how the neurosciences have become prominent in the public eye, the extent to which neuroscientific discourses have penetrated a variety of contemporary contexts, a minority but nonetheless highly visible “neuroscientific turn” in the humanities, and the inflation and hype of the neuro as well as on the limits of the hopes and promises that sustained them. From laboratory ethnography to the philosophy of mind, no area of intellectual endeavor has remained unconcerned, and nor has business. Where does that leave society and subjectivities? Sociologists have demonstrated that most people use neuroscientific information and idioms pragmatically and that, contrary to what was apparently expected, the neurosciences have neither dramatically altered people’s relations to their selves, nor radically challenged our notions about the self and the world. As the sociologist Alain Ehrenberg remarks in his contribution to Neurosciences et société, neuroscientific research is by definition mechanistic and focuses on causes; but in real life, people are rarely “reductionistic,” and even those who are curious about brain-based explanations also look for the “reasons” (e.g. biographical and existential) that contribute to explanations of their psychological distress or mental illness. This, however, does not mean that the societal leverage of the neuroscientific outlook depends on individual preferences. When (just to take one example) the director of the US National Institute of Mental Health asserts that “mental” or “behavioral” illnesses are in fact brain disorders and that psychiatry must fully become a neuroscience discipline, he formulates views that exert a major influence on public health policy and the allocation of resources – and thereby impact people’s lives regardless of individual or group conceptions and practices of the self. Such are some of the “stakes of knowledge and practices of the brain” that Neurosciences et société explores from several points of view and by way of a variety of materials. The volume is composed of five sections including a total of eleven chapters. Part I comprises two chapters tracing the development of contemporary neurosciences; in Part II, two further chapters deal with the presence of the neurosciences in the French printed media of the 2000s and the “distortions” that neuroscientific discourses undergo not only through “journalistic” adjustments in the media (magazines and television), but also in scientific publications themselves. Part III devotes two chapters to exploring therapeutic interventions and the notions of care they embody through the cases of deep brain stimulation and cognitive remediation therapy in schizophrenia; these two chapters consist in varying degrees of materials from ethnographic work carried out in psychiatric institutions. The three chapters in Part IV examine the dynamics of associations of patients diagnosed with autism and obsessive-compulsive disorder, as well as the genesis and French forms of the “neurodiversity” movement. Finally, Part V comprises two reflections around the tensions between mind and brain, one on the brain as the object of philosophy and self-reflection, another on the locus of psychiatric illness: the mind or the brain, the self or an organ of the body. Neurosciences et société contributes to a scholarly field dominated by the English language and by analyses generated in and dealing with Anglo-American settings. On its topic, even if its readership will be necessarily limited, a book in French and making room for other contexts is to be welcomed. Inevitably, however, its publication does not by itself change the basic situation: almost on the contrary, since the chapter bibliographies are themselves witnesses to an obvious Anglo-American ascendancy. At the same time, this “hegemony,” if it is to be so called and whether or not we judge it inevitable, is very much like what happens in many other domains. What the editors depict as the “social life” of the neurosciences – the circulation and transformation of neuro discourses, information and practices, as well as their appropriation by individuals and groups – is indeed a global phenomenon. There are, of course, some local differences. For example, Brigitte Chamak in several articles and in her chapter (with Béatrice Bonniau) describes the “French singularity” as far as “neurodiversity” is concerned. The members of French autistic persons’ associations are much more inclined than their North-American counterparts to accept the definition of autism as a neurodevelopmental disorder, rather than as a way of being that results from a peculiar but not fundamentally pathological wiring of the brain. Still, it is fair to say that, from Brazil to China and from Canada to Australia, the commonalities in the forms taken by the “social life” of the neuro are – where such a “life” exists – far more salient than the significant differences. Beyond the insights and information offered by the individual chapters (and even in the regrettable absence of an index), the mere fact that Neurosciences et société attests to such globalization is significant in itself. Fernando Vidal is Research Professor of ICREA (Catalan Institute for Research and Advanced Studies) at the Center for the History of Science, Universitat Autonoma of Barcelona. He has published widely on the history of the human sciences, from early modern psychology to contemporary neurocultures. He is author among others of The Sciences of the Soul: The Early Modern Origins of Psychology; his most recent edited book (forthcoming, with Nélia Dias) is entitled Endangerment, Biodiversity and Culture. The “Foreign Correspondents” series features reviews of books published in languages other than English. It is edited by Stephanie Lloyd (Laval University). If you would like to suggest a non-English language book for review or if you are interested in reviewing for “Foreign Correspondents,” please contact Stephanie directly at stephanie.lloyd@ant.ulaval.ca. Vidal F. Brigitte Chamak and Baptiste Moutaud’s Neurosciences et Société. Somatosphere. 2015. Available at: http://somatosphere.net/2015/chamak-moutaud-neuroscience.html/. Accessed April 26, 2019. Vidal, Fernando. 2015. Brigitte Chamak and Baptiste Moutaud’s Neurosciences et Société. Somatosphere. http://somatosphere.net/2015/chamak-moutaud-neuroscience.html/ (accessed April 26, 2019).